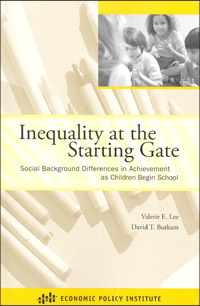 Inequality at the Starting Gate is a new EPI study of the learning gap between rich and poor children when they enter kindergarten. This study, by two education experts from the University of Michigan, analyzes U.S. Education Department data on 16,000 kindergartners nationwide, showing the direct link between student achievement gaps and socioeconomic status. The report finds that impoverished children lag behind their peers in reading and math skills even before they start school. It shows how a lack of resources and opportunities can cause lasting academic damage to some children, underscoring the need for earlier and more comprehensive efforts to prepare children to succeed in school.